Discover what those television ratings really mean. 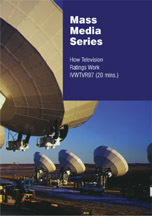 Television programming including news, sports and entertainment is driven by RATINGS. Discover what those television ratings really mean. Television programming including news, sports and entertainment is driven by RATINGS. In this video, students will discover how ratings are determined by using randomly selected households across America. This program shows how sampling takes place and how homes are selected to participate. Using people meters, see how rating companies know who is watching a particular program and how ratings drive the radio and television industry. This video will help clear up the confusion on what those television ratings really mean.